Traditionally, the landscape drawing is connected to description and the mimesis of the environment. It functions as a static cropping of nature and depends on the contemplating interpreter’s hand to exist. it is not an autonomous process and it cannot occur without his or her control. That which is presented inside the frame is simply a selection from a field that continues beyond its limits. The interest on methods and systems lies in the desire to apply those to the production of images that are related to the description of the landscape, and they not only guarantee a free means of manifesting to the landscape itself inside the work, but also allow the same gauging quality to the many varied types of space. The artistic contribution resides in the elaboration of the code, and not in the result, which does not arise from an isolate human desire, but occurs combined to an unpredictable ensemble of variations in the state of the environment. The wind line project is a mechatronic system that allows the creation of drawings, based on successive readings of data related to the behavior of wind currents in the environment in which the system is inserted. 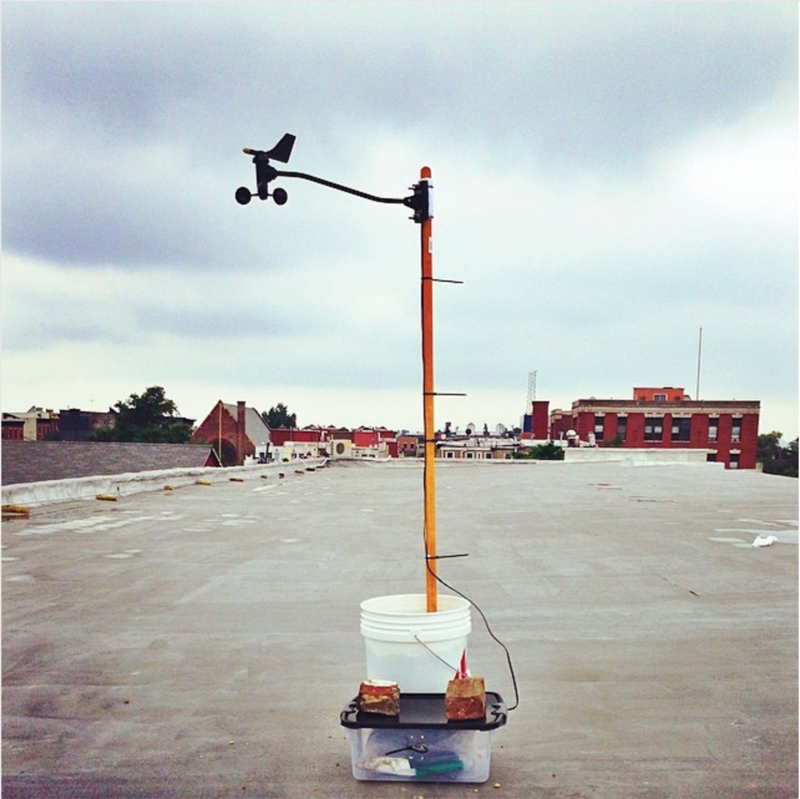 Data collected by an anemometer is transmitted through communication signals, that are customized for this application and interpreted by a reading software. This software relays the information for a plotter utilizing the velocity as a dislocation vector and the direction of the cardinal points as coordinates, creating commands that move an arm with a pen within a drawing area, respecting predefined representation heuristics. The duration of each drawing depends only on the type of graphic investigation that one intends to observe, and the exposition can be short or long.